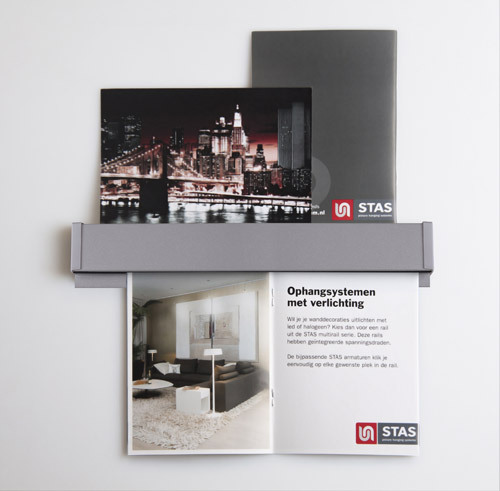 STAS papergrip is the newest addition to the STAS range: one rail with two uses! Thanks to a strip, paper and small posters can be easily locked into the rail and can be removed again with a single motion. Secondly, cards and similar objects can be placed in the special edge on top of the rail. STAS papergrip is suitable for both thick and thin paper and can even hold light magazines and laminated paper. Multiple rails can be connected to create a hanging system that spans an entire wall. The rail is available in different colours and has three mounting options: mount with STAS rail clips (RD40100), magnet tape or with doublesided tape. For more information or prices, please send an e-mail to sales@stas.nl or call +31 (0)40 292 48 48. STAS Projects is the contractors’ branch of STAS picture hanging systems BV. STAS is developer, manufacturer and distributor of high-quality hanging systems. Our systems can be found in over 50 countries; in private homes, in corporations, non-profit institutions and in museums and galleries.